It might be more famous for its dog mascot than anything else, but Churchill’s insurance is also quite popular. It has offered home cover for the past 25 years, giving policyholders the option to supplement basic cover with a number of additional extras. You can get a quote for Churchill home insurance here. See if it features in our list of the best home insurance companies. Churchill is underwritten by U K Insurance Limited. Although it started as a car insurance provider, Churchill has diversified into several insurance categories, first launching home cover in 1990. 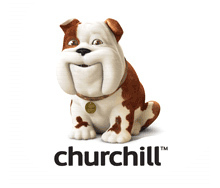 Since the early 2000s it has been one of the largest general insurers in the UK, and has received widespread recognition for its mascot, the Churchill dog. It also offers travel and pet insurance. Churchill’s motto is ‘your dependable friend’ – a slogan that inspired the use of a dog in its marketing activity. Churchill's Standard home insurance policy with buildings cover up to £1,000,000 and contents cover up to £50,000. Both types of cover are also available separately. General policy benefits include up to £1,000 landscaping/plant cover, a 12-month guarantee on building works carried out by a Churchill-approved repairer, alternative accommodation in the event your house becomes uninhabitable, and a 24/7 helpline. Cyclists can insure bikes worth up to £500 as standard. If you have buildings cover, Churchill will pay to find the cause of a water leak and will also sort the damage it causes. The policy's limits and a £450 Escape of water excess will apply. You can get a quote from Churchill here. Family legal protection – for an additional £26.88 per year (including premium tax), if there's more than a 50% chance of recovery, Churchill covers up to £100,000 of legal costs for some of those arguments. How much does home insurance from Churchill cost? The exact price of your policy will depend on several factors – including the age of your home, its condition, location, and the value of contents you wish to insure. Naturally, the more additional extras you select, the higher the premium is likely to rise; as stated above, for example, family legal protection starts at £26.88 a year, if there's more than a 50% chance of recovery. However, it is advisable to make sure you take out adequate cover, even if it’s not the cheapest option, to avoid finding yourself without home insurance protection in the event of a claim. According to Churchill, 30% of its customers paid £100 or less for combined buildings and contents policies between 17 May and 17 November 2018. This excludes optional extras and Home Plus policies. Churchill's cover is underwritten by U K Insurance Limited. To get an accurate home insurance quote, the best route is to contact Churchill directly and discuss policy options and budgets. You can get an online quote for Churchill home insurance here. On Reviews.co.uk, Churchill has a score of 3.9 out of 5 from over 590 customer reviews. Fairer Finance gave Churchill home insurance a customer experience rating of 57% in spring 2018, ranking it 22nd out of 47 companies. Online review website Review Centre gives Churchill a 1.6/5 star rating for its home insurance, based on over 90 customer reviews. You can check out our guide to the Top 10 Home Insurance providers here. Financial product rating company Defaqto gives Churchill 5 stars for its home insurance policies. Independent review site Fairer Finance gives a star rating for the quality and cover levels of a policy. Churchills Home Plus policy scores 4 out of 5 and its Home Insurance scores 3 out of 5. Interested? Get a quote for Churchill home insurance here. Follow this link to get a quote for Churchill home insurance. You could also check out our guide to the Top 10 Home Insurance providers here.